environmental education – year 6 and up. In the heart of South West Tasmania’s magnificent World Heritage Wilderness stands Federation Peak, one of Australia’s most challenging mountains. 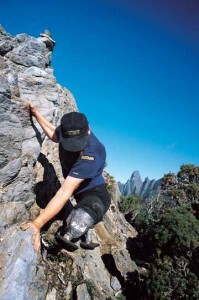 Against all the odds double above-knee amputee Warren Macdonald spent 28 epic days hiking to and climbing the peak. Walking away from the social constraints so readily applied to the disabled, and journeying into wild nature, Warren casts off the shackles and goes in search of the personal freedom he enjoyed before his horrific accident two years before. The Second Step is the profound story of one man’s extraordinary courage and determination to take back control of his life. Jury’s Prize: Explorers Club Film Fest 2005.